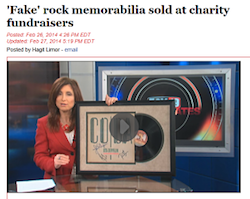 This Cincinnati news station did an in-depth review of the charity auction rock memorabilia market. How would you handle this sad situation? Visualize your gala. You’ve worked hard to acquire items, and your guests are milling through a large auction. Some of the items are the local sorts of donations one often sees at events in your area. Other items are more glamorous because you’ve worked with a memorabilia company to bring in “big ticket” items. Guests are ogling and bidding on the merchandise, buying signed guitars from their favorite bands and snapping up memorabilia signed by celebrities. The auction is buzzing with excitement and you’re raising thousands of dollars. After your gala, the local news station does an in-depth feature on your event and shows the world that virtually all of the memorabilia you presented as being “real” was fake, even those with the “Certificates of Authenticity” attached on the back. Do you take the consignor to court? Do you hire a good P.R. firm? I’m going to let the newsreel speak for itself, but here’s the short of it: The fake memorabilia market is larger than the real memorabilia market. This puts you in a precarious position if your nonprofit is selling signed rock memorabilia in your auctions. Who do you trust? Stories like this are why some of my clients “just say no” to memorabilia. A few take an even more aggressive stance, refusing to accept anything – memorabilia or not – if the item has a price attached to its sale. If it’s consigned, it’s not in their auction. As I’m not a signature or memorabilia expert, this is one area where I can’t help my clients. Outside of sharing information like this story, I can’t authenticate a piece for them or verify that a particular company has legitimate merchandise. It’s fun to have charity auction memorabilia in the auction, isn’t it? It can be exciting to bring in some of the pieces. But this presents the downside of the industry, too. All food for thought. Got any insights? Share them below. Hey there, Sue Ellen! Seeing your name pop up on my blog made me smile. Good input, as I’d expect from you. Cheers! We’re VERY lucky in the Milwaukee area. Jeff Lemieux of Jeff’s Sports on Capitol Drive in Brookfield, Wisconsin is reputable and trustworthy, and will NOT steer anyone wrong in his work helping out with consignment pieces. I trust Jeff, and so does everyone else. Class act! That’s great that you have someone you trust, Jen! What I took away from the research was that it’s tricky for a single person (a consignor, in this case) to be an expert in all signatures and memorabilia; it’s such a big industry and there’s simply so much of it. It’s hard to become an expert in every signature … every band … every celebrity. Consequently, even without intending to, some good folks might distribute fakes. Last week I worked an event where a signed musical instrument with a certificate of authenticity from the performer had been donated by an individual. It “looked” legit. But in this case, it was donated by an individual — not a consignor. This makes it even more difficult because I often see these types of pieces get bought at one gala and then donated to another gala. The nonprofit accepts the donation, assuming the piece is real. But from this article, I’d place my bets on saying that it wasn’t authentic. It’s tricky all around, isn’t it?